Located on the most magnificent 20 mile strand of white sugar sand beaches you could possibly imagine, and one of the best kept secrets in the world - THE BEACHES OF SOUTH WALTON. Awaken each day to a natural, unspoiled, coastal environment with clear turquoise waters and thriving native Sea Oats, Crepe Myrtles, and Palmetto Plant life that truly make this area a 'BEACH PARADISE'. This GULF FRONT unit on the third-floor of the Monterey Condominium Complex offers spectacular views of the sparkling Emerald Waters and breathtaking Sunsets. One of 24 luxury units directly on the beach. This condo is situated between Panama City Beach and Seaside Village on Scenic Highway 30A, near Rosemary Beach, Seagrove Beach, Water Color, and Water Sound. The master KING suite has a separate entrance to balcony, large whirlpool tub, his and her vanities, separate shower, and a large walk-in closet. All bedrooms have flat screen TVs. Additional sleeping is provided in the hallway with a small bunk area. This bunk area has two twin beds and sleeps two. Enter through a security gate to the parking area. This Non-Smoking condo is one of only twenty four units in the complex and has elevators and stairways for easy access. We have decorated this unit in bright coastal colors with a seaside motif for your enjoyment. The unit is fully-equipped to afford you all the conveniences of a home away from home. It will be a vacation that you and your family will long remember. 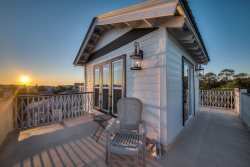 Our goal is to make your vacation as enjoyable and relaxing as possible, so that you will want to make our home your home away from home each time you vacation on South Walton's beaches just as generations of families return year after year. Over a dozen golf courses are within a short distance, and restaurants and shops are located all along Hwy 30A or venture out to Silver Sands Outlet Mall, Destin Commons, Pier Park, and Panama City is only minutes away. Several grocery stores and excellent dining facilities are just minutes away. 5) There will be roof maintenance to this condo’s building in late April and May. Rates have been adjusted to compensate for this work. No discounts will be provided for unforeseen disturbances that may arise during this time. All details were well handled. We had no issues accessing the property or with checkout. Great experience with 30A Escapes! The unit we rented was perfection and all the details leading up to our arrival were well handled. Checkout was a breeze. Will look to 30A Escapes when we plan our trip next year. The condo wa beautiful and comfortable with the most amazing views!!!! They were very attentive and helpful! We had one day that the air shut off due to a safety feature. When I contacted them at 8:30 pm they immediately sent somone our to fix it. Very professional and responded timely to my emailed questions. Enjoyed being right on the beach. The house was nicely decorated. Enjoyed the bikes. Very kind staff with the broken washing machine. Coffee maker was broken upon check-in and a replacement was sent over right away. Overall, a beautiful room that left us with wonderful memories. The spaciousness of the unit was ideal with a large family. Views were fabulous! We enjoyed it, one of my roommates plans to use the unit for family in the near future, we loved it. Celia responded immediately to my concerns, and the property manager attended to the pool immediately as well. A gorgeous yet casual beach condo with 3 en-suite bathrooms, this was a perfect place to spend our 30A vacation. We look forward to returning next year! Experience with property team was great. Property very nice and clean and renting this property went very well with no issues at all. We loved that it was oceanfront and convenient to everything.